Mini Incubator is compact and economically priced, yet offers features not typically found in a basic incubator. The housing is all metal, as is the door frame. A plexi-glass window in the door offers full visibility to the interior. One shelf is included, and can be adjusted to three different levels - additional shelves can be purchased to increase storage capacity. The heating elements in Mini Incubator are incorporated into the bottom and sides of the housing. This provides better temperature stability and uniformity than other incubators in it's class. A grommet hole in the top of the unit can hold a thermometer for accurate temperature setting. In addition, the Mini Incubator has a port in the rear of the chamber which allows for an electrical cord to be routed out the back. 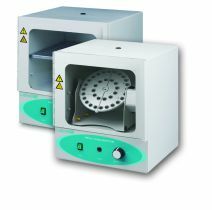 Labnet's Mini LabRoller is a perfect fit and can be used in the Incubator with any of the available rotisseries. A combo package is available which includes the Mini Incubator and Labroller, along with the accessory rotisseries.